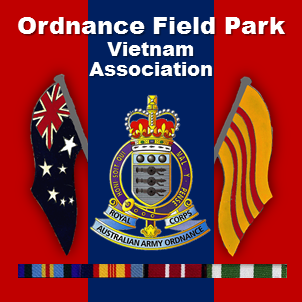 2008 – 40th Anniversary of FSB Coral – Ordnance Field Park Vietnam Assn. In May 1968 Australian troops established Fire Support Bases (FSB) Coral and Balmoral across the route used by the Viet Cong to depart, and approach, Saigon and nearby Bien Hoa. The bases provided defended positions for artillery, mortars and armoured vehicles which would, in turn, support infantry patrols of the area at a time when expectations of enemy attacks on Saigon were high. The 1st and 3rd Battalions Royal Australian Regiment (1 and 3RAR), 102 Field Battery, Royal Australian Artillery, and 161 New Zealand Field Battery, deployed into FSB Coral on 12 May 1968. 1 and 3 RAR began preparing ambush positions but these were incomplete when a North Vietnamese Regiment attacked the base during the early hours of 13 May. The North Vietnamese, having penetrated the 1RAR Mortar Platoon and 102 Field Battery positions and briefly forcing the defenders to abandon one of their artillery pieces, were forced back after heavy fighting. Coral came under attack for a second time at 2.15 am on 16 May when an estimated three battalions of North Vietnamese infantry assaulted the base which was, along with infantry, now also defended by armoured personnel carriers of A Squadron, 3rd Cavalry Regiment. Fighting lasted several hours before the attackers were forced to withdraw. Further mortar and rocket attacks on Coral followed, on 22 May, and again on 26 and 28 May, but the base was not seriously threatened again. Having had the opportunity to establish a strong defensive perimeter, the Australians were able launch their own attacks against the North Vietnamese. On 26 May, in a major contact, infantry and tanks destroyed part of a North Vietnamese bunker system that had been discovered in the vicinity. The Australians continued to launch aggressive patrols from Coral, engaging in combat against North Vietnamese forces and experiencing some fierce actions through until the end of May. By this time the North Vietnamese had turned their attention to FSB Balmoral which had been established by 3RAR some 4.5 kilometres north of Coral on 24-25 May. Tanks from Nui Dat helped Australian infantry defeat a two battalion-strong North Vietnamese attack just hours after their arrival at the base on 25 May. A second attack followed on 28 May, but a combination of infantry, armour, aircraft, artillery and mortars repelled the North Vietnamese assault. North Vietnamese activity in the area subsided and operations at Coral and Balmoral were suspended on 6 June 1968. Twenty six Australians were killed during the fighting at Coral/Balmoral. Estimates suggest that more than 300 North Vietnamese were killed in these actions, but exact figures cannot be obtained. The following Veterans of the battles for FSB Coral, together with their wives/partners, gathered in Canberra ACT to attend anniversary commemorations arranged on 12th and 13th May 2008. Monty Brown, Colin & Roseanne Cross, Tony Flanagan, Stan & Ruth Hall, Ron & Dot Meppom, Graham Patzel, Eddy Place & Winky Lowry, John & Colleen Redman, Stan & Veronica Stefanowicz, Alan Whitaker, Les & Gail Wilkiinson. Brian & Lorraine Spurway (176 Air Despatch- RAASC), Bill & Lyn Starrenburg (1 Div Supply T’port Wkshop- RAEME)), Max & Helen Ball (Det 8 Petroleum Platoon). Lorrae Desmond (Entertainer) Dinah Lee (Entertainer) Sylvia Raye (Entertainer), Jim & Allison Bourke (Operation Aussie Home), Rodney Whitaker (Alan’s son) Emily Stefanowicz (Stan & Veronica’s grand-daughter), Kim Kirk (Les & Gail’s niece who acted as our photographer for the commemoration) and Bob & Christine Nash (OFP 67/68). The commemorations started with a meet and greet at our Head Quarters for the reunion, the Queensgate Motel, Queanbeyan, on the afternoon of Sunday 11 May 2008. This was a chance to catch up with everyone again, some after forty years. The first official activity was on Monday evening 12 May 2008 which was a reception by the Prime Minister (Kevin Rudd) at the Great Hall, Parliament House, Canberra from 5.00pm until approx 8.00pm. Approx 2200 attended this reception. Speeches were made by the Prime Minister, Dr Brendan Nelson (Leader of the opposition) and others. Dr Nelson’s address was very moving and well received by those attending. On Tuesday morning, 12 May, a Remembrance Service was held at the Vietnam Memorial at 10.00am. This was attended by the Prime Minister, the Governor General and other VIPs. Again, speeches were made by the VIPs attending. The ceremonies included a Royal Salute and Inspection of the Guard and Band by the Governor General, laying of wreaths and reading of the Honour Roll before a March Past of Unit Banners of those units involved in Coral/ Balmoral. Our Unit Banner was proudly carried by Graham Patzel and John Redman and accompanied by Monty Brown (2Lt at Coral). The final planned activity was a dinner held at the Ainslie Football & Sports Club, on Tuesday night, for all the “Other Corps” who were at Coral. A good time was had by all and it was a fitting conclusion to the commemoration activities. FOOT NOTE. Special thanks to Les Wilkinson for his role as the Unit Co-ordinator for this special reunion.